Nearly 4,000 Canadians died as a result of opioids in 2017, a 34-per-cent jump from the previous year. Opioid deaths are accelerating in the hardest-hit provinces of British Columbia and Alberta, with Canada’s top doctor describing the growing crisis across the country as “devastating.” In B.C. 1,399 died compared to 974 in 2016. 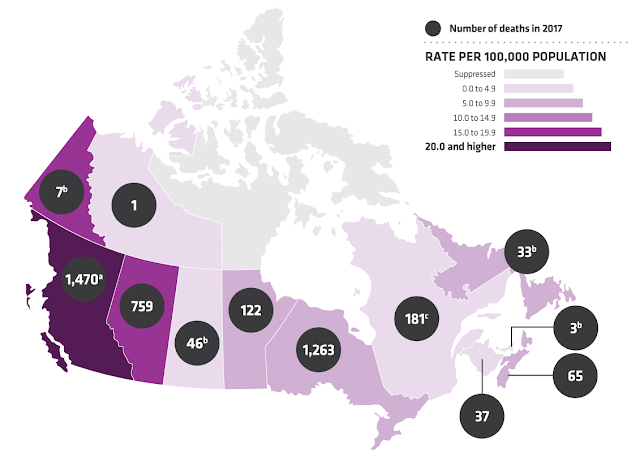 In Alberta, there were 714 deaths in 2017 compared to 548 in 2016. In Ontario, more than 1,100 people died from opioid overdoses last year, up from 726 a year earlier. Dealers "eradicated a small town of Canadians in just one year” said one expert. 90% of the deaths were unintentional, and 72% involved prescription or illicit fentanyl, an increase from 55% in 2016. The majority of deaths involved men.